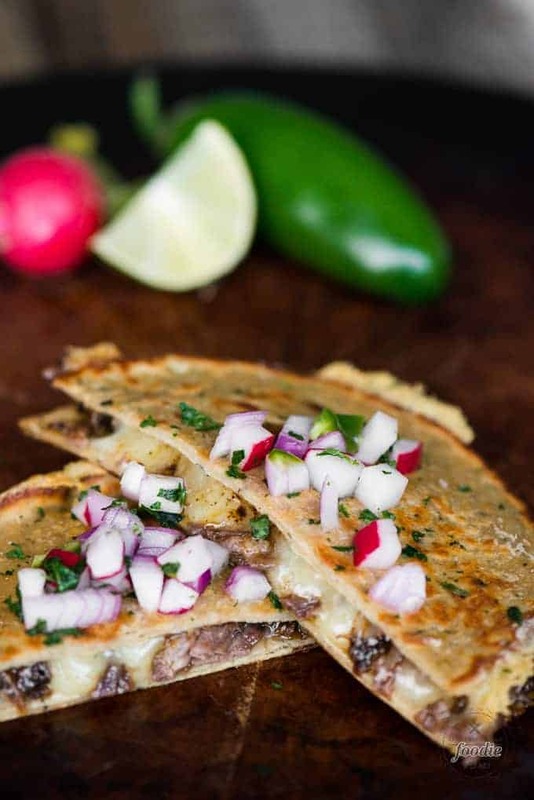 Barbacoa Quesadillas are made quick and easy by pressure cooking the beef roast with an amazing chipotle sauce, then melting cheese in the best tortillas. Your search is over for the very best barbacoa recipe. 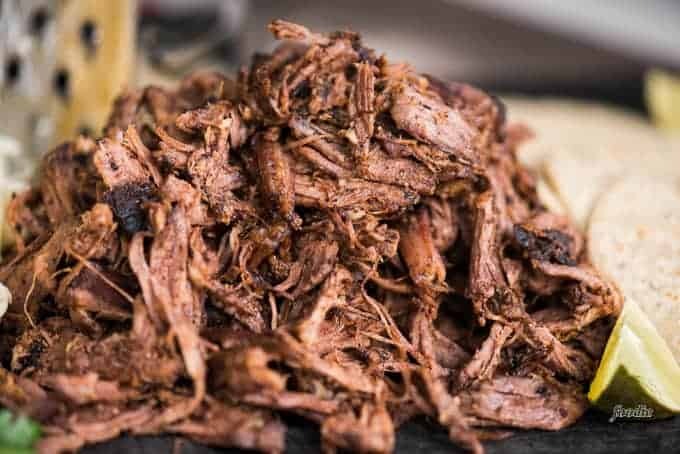 Keep on reading and I’ll tell you how to make the easiest and most incredibly tender shredded beef barbacoa in an Instant Pot. Then I’ll tell you about the best tortillas out there to make your Barbacoa Quesadillas insanely delicious. Finally, I’ll let you know how YOU can win a free Instant Pot! This post was sponsored by La Tortilla Factory and they have generously offered to provide the Instant Pot for the giveaway, but all opinions are 100% my own. Barbacoa Quesadillas may just be the very best thing I’ve ever made in my kitchen. I kid you not. This is my first time making chipotle barbacoa of any kind. If you search the internet for barbacoa recipes, you’ll find a ton of variation out there and most of them are barbacoa slow cooker recipes. Every since I started using my electric pressure cooker, or Instant Pot, I haven’t touched my crockpot for anything other than to keep drinks and side dishes warm. Cooking a bone-in roast in an Instant Pot with the right seasonings and enough liquid to bring it to pressure creates unbelievably tender and flavorful meat. And that, my friends, is exactly what you want to put inside an amazing quesadilla fully of melty cheese, wrapped in a tender tortilla. It’s not often that I try a new product and fall in love instantly. When I sunk my teeth into that first bite, instantly fall in love is what I did. LaTortilla Factory became an instant favorite, and I can say with reasonable certainty that I shall never find a better tortilla! 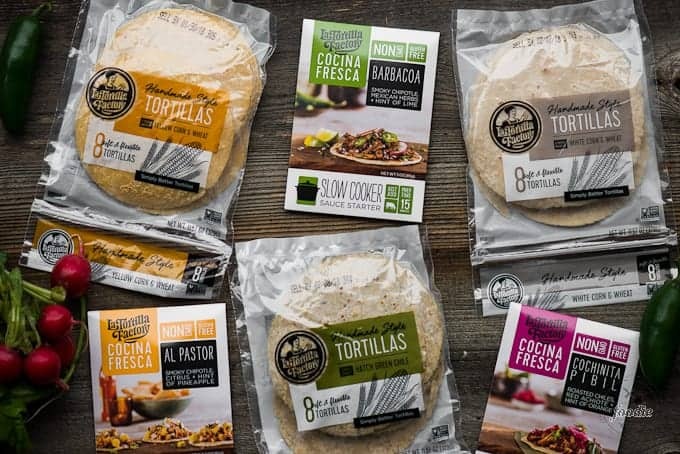 La Tortilla Factory’s newly revamped Non-GMO Hand Made Style tortillas are the perfect companion to your #InstaDinner. First of all, before even opening the tortillas, I couldn’t believe how wonderful they smelled. Second, the tortillas seemed incredibly soft. My first reaction was that I’d better use them up instantly because they were sure to go bad right away. You can imagine my shock when I saw that they’d be fresh for another couple months still? Mind blown. Then my gaze took me over to the sauce starter packs. Not only was I intrigued that they made cooking so easy (i.e. sauce + meat + easy cooking method like slow cooker = heavenly meal), but I was so impressed by the ingredients. Usually sauces are full of thickeners and preservatives. Allow me to list off the ingredients in the Barbacoa sauce starter: apple cider vinegar, canola oil, water, vinegar, salt, lime juice concentrate, chipotle pepper, tomato paste, red chile pepper, onion, cumin, oregano, bay leaf, black pepper, cloves. That’s it! That is exactly how the ingredients are listed on the package. I actually tasted the sauce before I put it in the Instant Pot and couldn’t believe the flavor. I can’t wait to use the other two sauce starters. 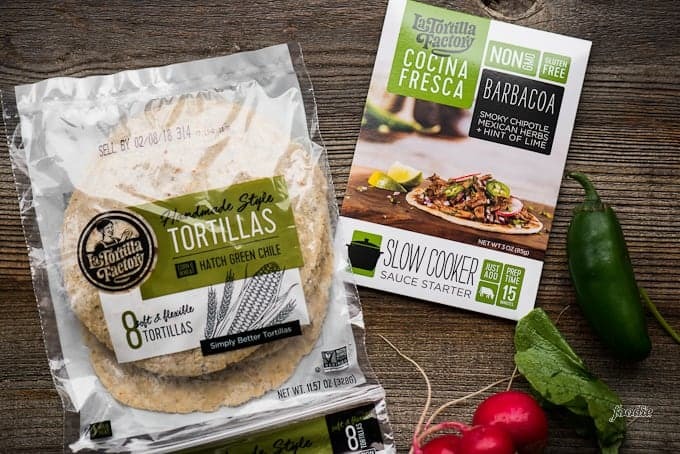 La Tortilla Factory is a delicious family-owned brand in the Sonoma/Santa Rosa, CA that’s been around for over 40 years. Fortunately their headquarters survived the Sonoma fire and everyone is safe! 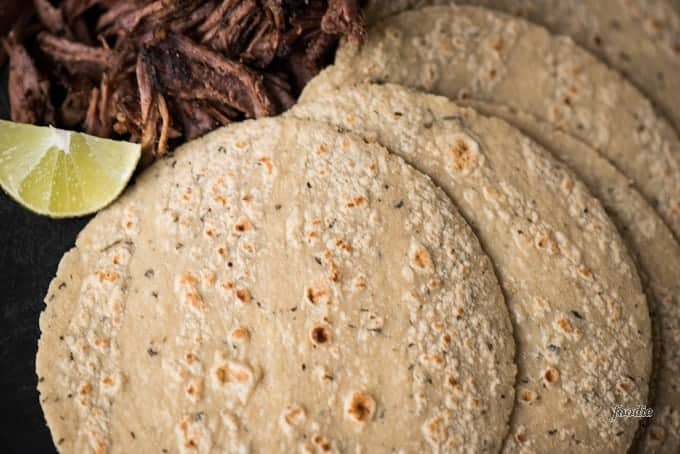 LaTortilla Factory products have used only the finest ingredients and delicious recipes – and includes gluten free options, low carb, and low cal. For this recipe, I decided to use their barbacoa sauce starter. The instructions on the package say to use a slow cooker, but since I think cooking with an electric pressure cooker far exceeds that of a slow cooker with respect to tenderness and time, I went that route. Barbacoa is a form of cooking meat that originated in the Caribbean with the Taíno people, from which the term “barbecue” derives. Traditionally, Barbacoa refers to meats or whole sheep slow-cooked over an open fire, or more traditionally, in a hole dug in the ground covered with maguey leaves. In the present day, we typically refer to meat that has been steamed until tender. A large pot is prepared with a little liquid which is usually water and/or pulque with vegetables and aromatic herbs, and then the meat is cooked via steam. This meat is known for its high fat content and strong flavor, often accompanied with onions and cilantro. 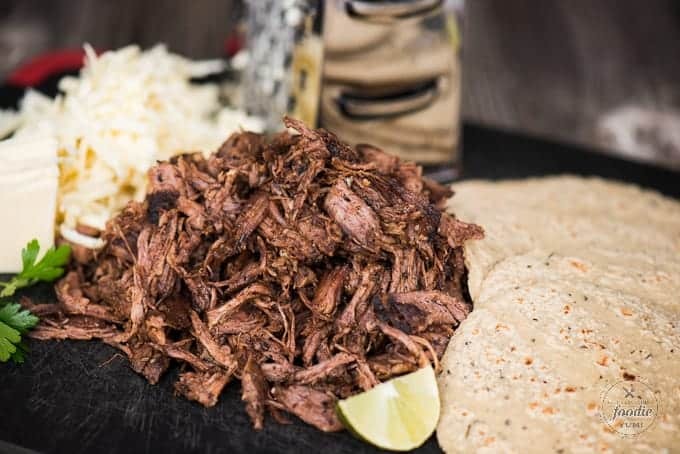 Full instructions are outlined in the recipe below, but there are a few easy tips to creating the most wonderful, tender Barbacoa in your own kitchen. Chose the right cut of meat. Pressure cooking works best with cuts of meat that are typically more on the tough side. I also highly recommend finding roasts that have a fair amount of fat as well as bone. I think a chuck roast is the perfect choice when making chipotle barbacoa because it cooks up so incredibly tender and is easy to shred. Good barbacoa requires excellent seasoning. Now, you can go to the trouble of measuring each ingredient on your own, but these LaTortilla Factory sauce starters are amazing. There is seriously no easy to go to the trouble of doing it yourself when they make it so simple and delicious. To pressure cook barbacoa in your Instant Pot, all you need is the meat, the sauce starter, and enough water to properly steam the meat. It’s that easy! You can easily serve the beef barbacoa on it’s own, but I found that grilling it in between two super soft LaTortilla Factory tortillas with some melty cheese was absolute heaven. I used the green chile tortillas and they were phenomenal. I just used the Where to buy feature on their website and am so excited that there are a ton of stores near my home where I can stock up on their products! 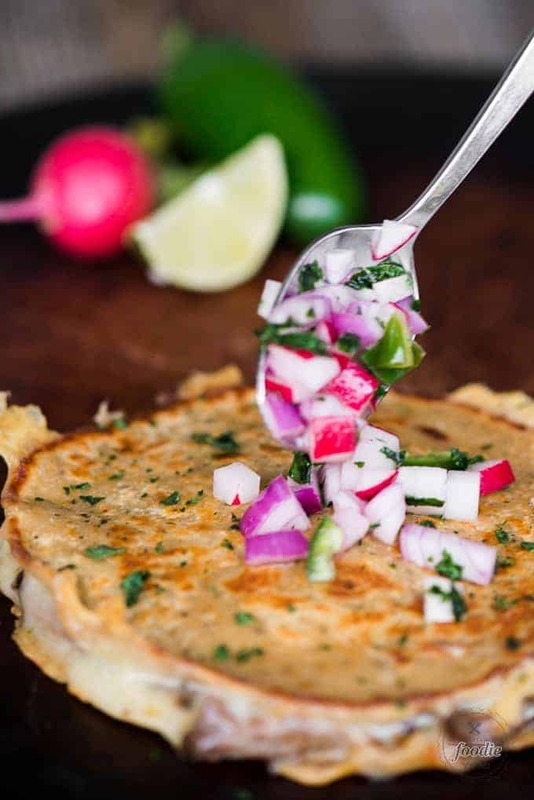 One of my favorite things to serve with foods like chipotle barbacoa quesadillas is a pickled radish salad. I eat this stuff all the time. It only takes a few minutes to chop up the radishes, jalapeno, and red onion. A squeeze of lime and a heavy dash of salt gets the process started. 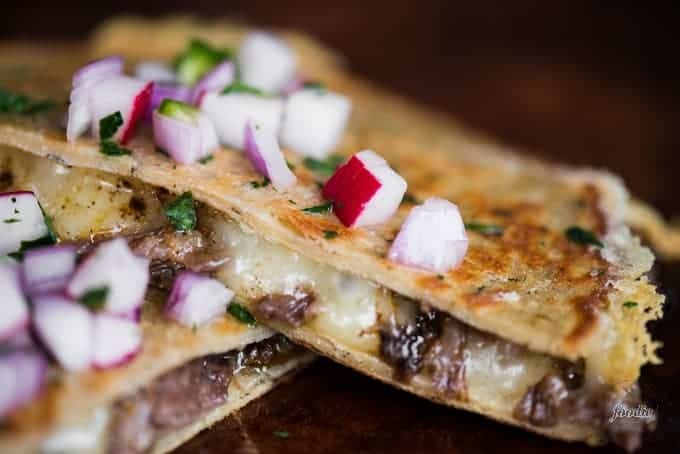 I am not lying when I tell you that these amazing barbacoa quesadillas might just be one of the best things that have ever come out of my kitchen! To make the Barbacoa Beef, add chuck roast, LaTortilla Sauce Starter, and water to your Instant Pot or electric pressure cooker. Cook on high pressure for 90 minutes (add 5 minutes per pound if roast is frozen solid). While beef is cooking, prepare the pickled radishes by combining radishes, jalapeno, red onion, lime juice, salt and cilantro in small bowl. When Barbacoa beef is done cooking, remove meat from pressure cooker, shred (discard fat and bone), and return to pressure cooker pot until ready to use. To cook quesadillas, heat griddle over medium high heat. Spray bottom side of LaTortilla corn tortilla with a very thin layer of oil, and place oil side down on hot griddle. Add a sprinkle of cheese, then a small handful of the shredded Barbacoa, then more cheese, and top with a second tortilla that has been lightly brushed with oil. Cook until tortillas start to turn golden brown and cheese melts, about 3-4 minutes each side. 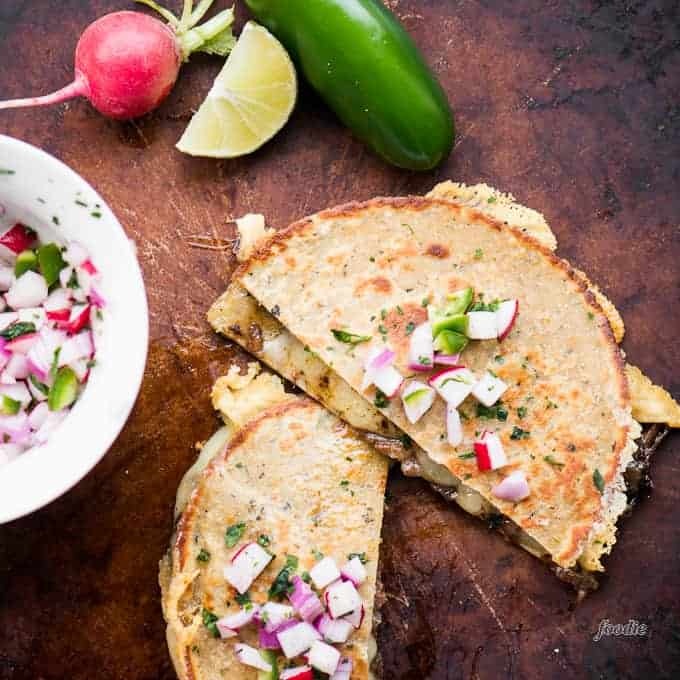 Serve Barbacoa Quesadillas with pickled radishes.